Brian has been married to his wife Sheryl for 32 years. They met while serving in the US Army and have two sons, two granddaughters, and one grandson. A majority of Brian’s time in the field was spent working for Viking Automatic Sprinkler in Portland, Oregon. He began working for Local 669 in 2002 as an Organizer followed by the District 1 Business Agent in 2009. 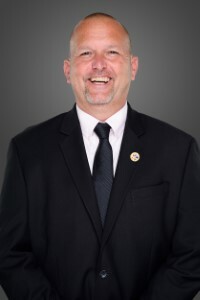 His next role with the Local came in 2013, when he assumed the Secretary Treasurer position followed by his current positon as Business Manager in 2016. As a US Army veteran, he enjoys shooting in service rifle matches where M-1, M-14, and AR-15 rifles are utilized. Other interest include motorcycles (both on road and off), golf, flying, and camping. In 1986, one year after graduating high school, Bobby became a member of Local Union 669. From his start as an apprentice to his present position as Secretary Treasurer, one value has never changed and that is to give his best because the membership deserves nothing less. This value was instilled in him by his father, a 50-year member in 2018, who Bobby would like to thank for being a great role model to himself and countless others. Married to Shannon and blessed with one son and three daughters, Bobby spends his free time watching their soccer games and going to events together as a family. 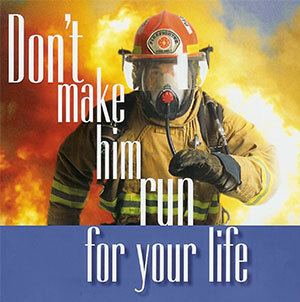 Brian started his sprinkler career with Dalmatian Fire Inc. out of Indianapolis, IN. Brian began serving the membership in July of 2005 and served in that capacity through August of 2014 as Business Agent for District 13. 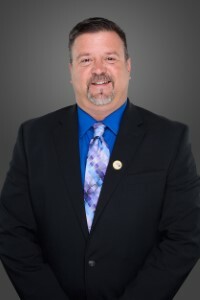 During that tenure he also served as Executive Vice President and President of the Indiana State Pipe Trades Association. 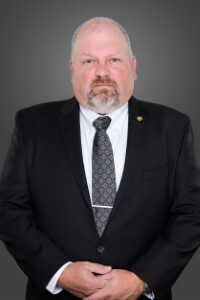 In 2014 he was appointed Central Region Assistant Business Manager where he continued representing Local 669 until January 2017 when he assumed the role of President-Organizer. He has a beautiful wife of 21 years and an intelligent and stunning 16-year-old daughter. He enjoys hunting & fishing. 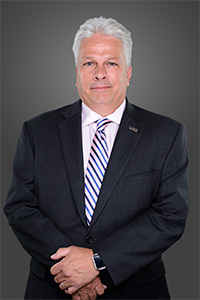 Thomas D (Tom) Jarnigan is a 27-year-member of Local 669. He is from the East Tennessee area. 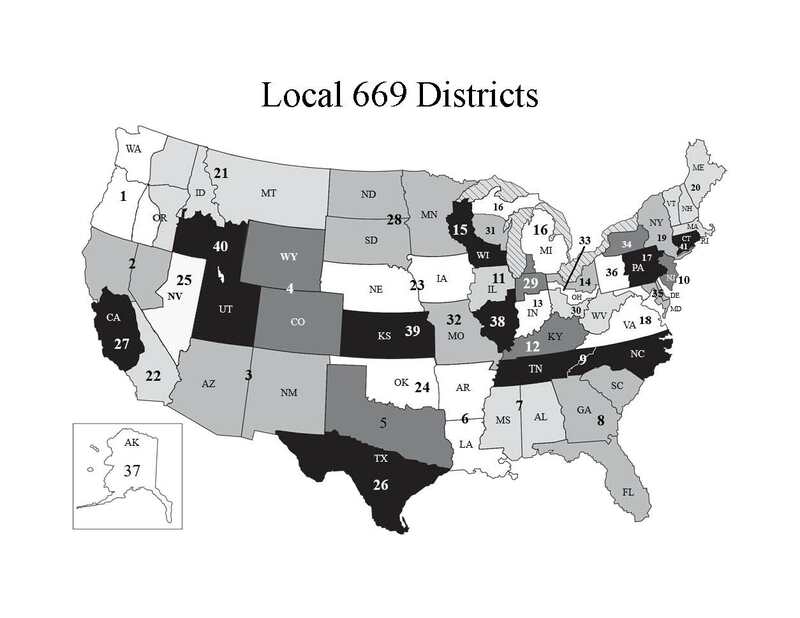 Tom served Local 669 on the Executive Board starting in November of 2011. He spent two years as the Southern Region representative, over two and a half years as Recording Secretary for the Executive Board and now as Vice President since July of 2016. Tom has a beautiful wife named Gina, a daughter, Jasymn, and a son, James. They are dog lovers and have three adorable Boxers, Sadie, Vegas and Maverick. When Tom is not working, he enjoys spending time on the golf course with Gina whenever they get the chance. Our local jurisdictions are managed by four Assistant Business Managers, 41 Business Agents, and various Organizers. Click on any of the links in the "In This Section" for more information about the local representative for your area. Below is the District Map so that you can see where your next project lies. Click on the Map to Download a .PDF Version to Print.